The gaming world is excited to play for Anthem, Bioware’s answer to Destiny and other big-budget online shooters — but an exclusive preview weekend for the mech-flying game has struggled to get off the ground. Of course, it wouldn’t be a game launch these days without a few hiccups to spice things up, but it is a little embarrassing. The 40-gigabyte demo was made available today to those who had pre-ordered the game, as well as press and other “VIPs.” The game, announced last year at E3, is a loot-focused shooter where you pilot mechs through a huge open world, engage in cooperative combat and exploration and all that. At least, so they say. Reports immediately came flooding in on forums and social media that not only was Origin, the service on which the demo is offered, failing to function properly, but that the game itself wasn’t connecting to servers, or if it did, wouldn’t load beyond the intro sequence. I encountered this myself; after eventually getting loaded and logged in, I managed to get into the starting town area where you will, in the full game, upgrade your gear, accept quests, and so on. But when I attempted to launch the first mission or otherwise enter the actual game world, the loading bar would stop about 95 percent of the way done and stay there forever (I waited about five minutes and reloaded a couple times to make sure it wasn’t just my aging rig). Those who made it all the way in complained of lag and glitches. 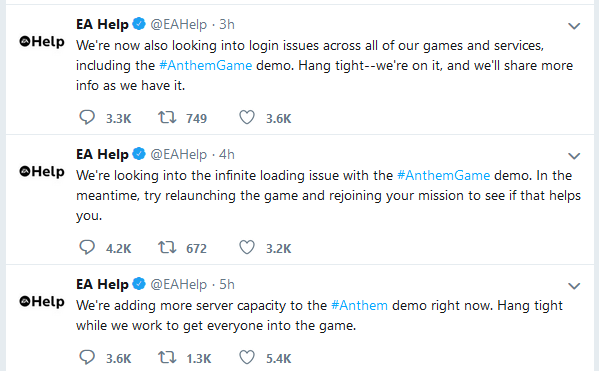 Funnily enough EA Help’s own servers were having trouble as well, so not only could people not play Anthem, they couldn’t report that they couldn’t play Anthem. Patience is a necessary virtue in today’s AAA game launches, but the people hoping to play this weekend aren’t randos but paying customers; this preview demo weekend was supposed to be a pre-order bonus, but the first day is a bust so far. Considering Bioware and EA knew exactly how many players could be trying to connect today — and those numbers are likely far less than those who will try the open beta or connect on launch day — it’s rather odd that they were seemingly caught so off-guard. Anthem is certainly promising and the developers have gone out of their way to assure players that many of the hated practices of online games these days would not find a home on their platform. But launch problems always jar the confidence of undecided buyers, and there’s almost no question that the game will be better a month or two after its actual debut. Launch numbers could be affected by players not believing the game is ready to play, and therefore not being willing to pay. I fully anticipate these issues getting resolved at some point soon, however, and will collect my impressions of the game in a separate post when that happens.